The record is made up of 1 volume (238 folios). It was created in 1 Jun 1915-21 Nov 1915. It was written in English and French. The original is part of the British Library: India Office The department of the British Government to which the Government of India reported between 1858 and 1947. The successor to the Court of Directors. Records and Private Papers. There is nothing to report to-day. troops remain long at Karej I hope reply may be sent without delay. Telegram P., No. 459-F., dated (and received) the 16th Novemher 191o. enced and nervous youth who requires constant management. in that quarter two powers would give their support to Persia. tal of Persia to us and would regularise use in Persia of Russian troops. to ?) raise revolution in the country. 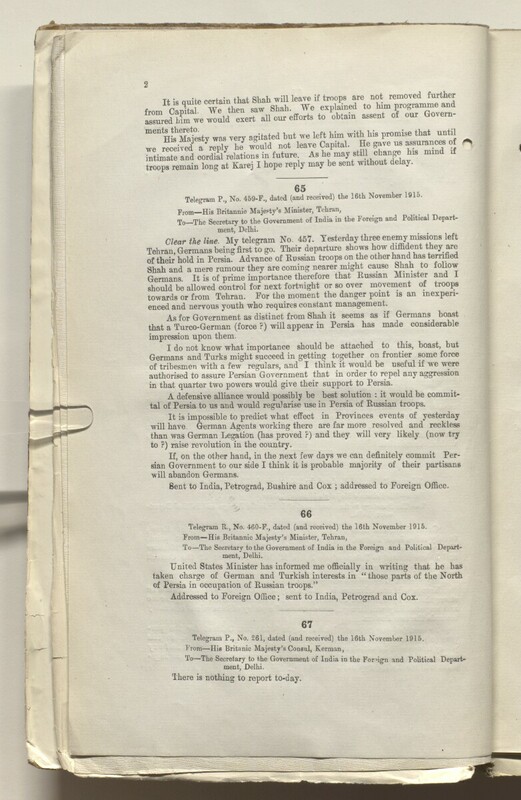 Bent to India, Petrograd, Bushire and Cox ; addressed to Foreign Office. Telegram R., No. 4-60-F., dated (and received) the 16th November 1915. Addressed to Foreign Office; sent to India, Petrograd and Cox. Telegram P., No. 261, dated (and received) the 16th November 1915. The volume contains correspondence regarding the Persian Campaign of the First World War and the movements and activities of the Central Powers in Persia [Iran] between June and November 1915. The correspondence is particularly concerned with German and Ottoman attempts to infiltrate Afghanistan from Persia, and of ensuring the continued neutrality of both Afghanistan and Persia. The primary correspondents are the British Legation, Tehran; the British Embassy, Petrograd [Saint Petersburg]; the Government of India; and the Foreign Office. The volume contains a single folio in French (f 184), a communication from the Russian Ambassador in London. Foliation: the foliation sequence (used for referencing) commences at the first folio with 1, and terminates at the last folio with 238; these numbers are written in pencil, are circled, and are located in the top right corner of the recto The front of a sheet of paper or leaf, often abbreviated to 'r'. side of each folio. A previous foliation sequence between ff 121-127, which is also circled, has been superseded and therefore crossed out. The foliation sequence does not include the front and back covers.